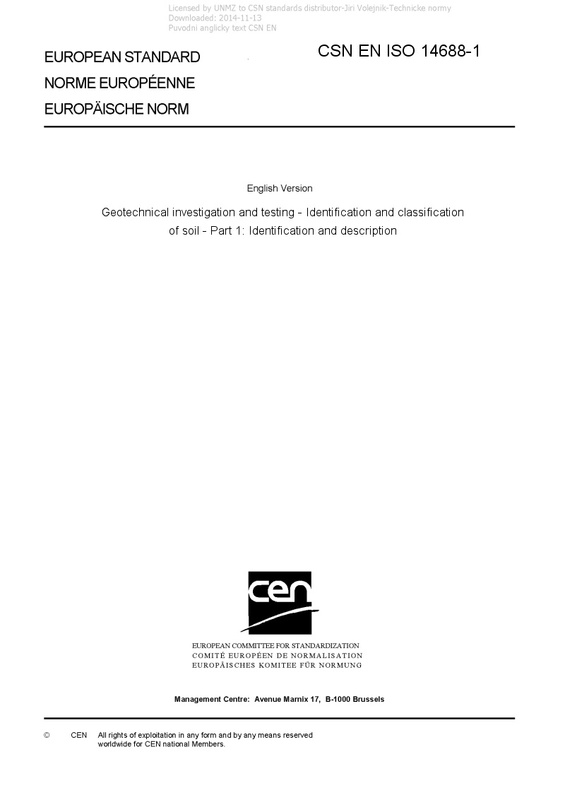 EN ISO 14688-1 Geotechnical investigation and testing - Identification and classification of soil - Part 1: Identification and description - ISO 14688-1:2017 specifies the rules for the identification and description of soils and is intended to be read in conjunction with ISO 14688-2, which outlines the basis of classification of those material characteristics most commonly used for soils for engineering purposes. The relevant characteristics could vary and therefore, for particular projects or materials, more detailed subdivisions of the descriptive and classification terms could be appropriate. ISO 14688-1:2017 specifies procedures for the identification and description of soils based on a flexible system for use by experienced persons, covering both material and mass characteristics by visual and manual techniques. Details are given of the individual characteristics for identifying soils and the descriptive terms in regular use, including those related to the results of hand tests carried out in the field as part of the descriptive process. ISO 14688-1:2017 is applicable to the description of soils for engineering purposes which can be those laid by natural processes, those laid by man or comprise synthetic materials. NOTE 1 The identification and description of rocks are covered by ISO 14689-1. Identification and description of materials intermediate between soil and rocks are carried out using the procedures in this document, ISO 14688-2 and ISO 14689-1 as appropriate. NOTE 2 The identification and classification of soil for pedological purposes, as well as in the framework of measurements for soil protection and for remediation of contaminated areas, is covered by ISO 25177.